G-Sonique's Renegade VSTi synthesizer is now also available in native 64-bit version. A presentation (with sound demos) of the upcoming Softube Modular, elaborated with Doepfer and to be released on May 11th. Softube has presented Modular, a new cross-platform modular synthesizer plug-in developed with Dieter Doepfer. U-He has announced that Diva v1.4.1 is now compatible with Native Instruments' new Native Kontrol Standard (NKS). Waves has updated its virtual analog synthesizer Element to version 2.0. Applied Acoustics Systems has announced the official release of their Ultra AnalogSession 2 synth plugin for Mac OS X and Windows. Arturia launched yesterday a big promotion to celebrate legendary keyboards that were used to create iconic music. Mutools released version 6.5 of its MuLab DAW and MUX Modular virtual synthesizer. 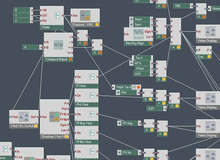 This week’s freeware comes from Matthew Tytel, a young Californian developer who has released beta version of a virtual modular synthesizer.